Thank you Lakeshore Learning for sending me this cash register to review. All opinions are 100% mine and I was not paid for this review. Reinforce real-world math skills...with a cash register that really works! The built-in calculator and digital display let kids add, subtract, multiply and divide as they ring up purchases! The cash drawer even pops open so children can figure out the correct change! 10 1/2" cash register has a large, solar-powered digital display; includes a “credit card” and play money. This item is sold for $34.99. Imagination play is one of the best types of play and it is one area I am always encouraging my children in. With technology everywhere children are starting to hop on board and ask for the Ipad or tablet before playing with their room full of toys. My kids have loved this cash register from Lakeshore Learning! They have liked it so much that I have had to enforce a time limits and turn taking because of some arguing. I have enjoyed the money labeling and practice with my daughter the most. She is a fast learner and instead of asking for a quarter for a gumball she soon will be asking for $20. 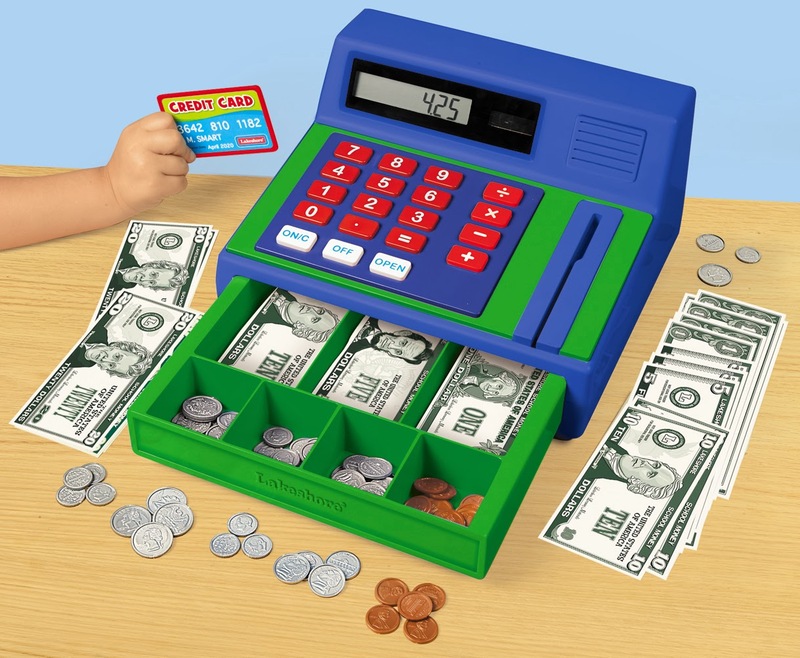 This cash register is sure to bring lots of imagination play especially during the cold winter months. Kids can now set up a store and actually make purchases with money or the credit card which we call the bank card. At a young age we are trying to make sure we encourage staying out of debt! This is a great toy to have at home that will allow minds to imagine but also help build math skills!